What do musical notes repeated for hours make happen in the body and the spirit? How does the memory of melody develop? Is it possible to remain concentrated on musicians for 300 minutes? In 1983 the American Minimalist composer Morton Feldman wrote his second string quartet. It lasts approximately five hours, in a single movement without pauses. The music imposes a new device and investigates our aptitude for long-term listening. The stamina of the musicians is tested along with the listeners, half dozing, as they lose all notion of time and find themselves living an experience in slow motion. The sense of time, the audience seated in rows, lose all their meaning in such a context. Therefore solutions must be found to allow the music to unfold in a space open to movement and to meditation. 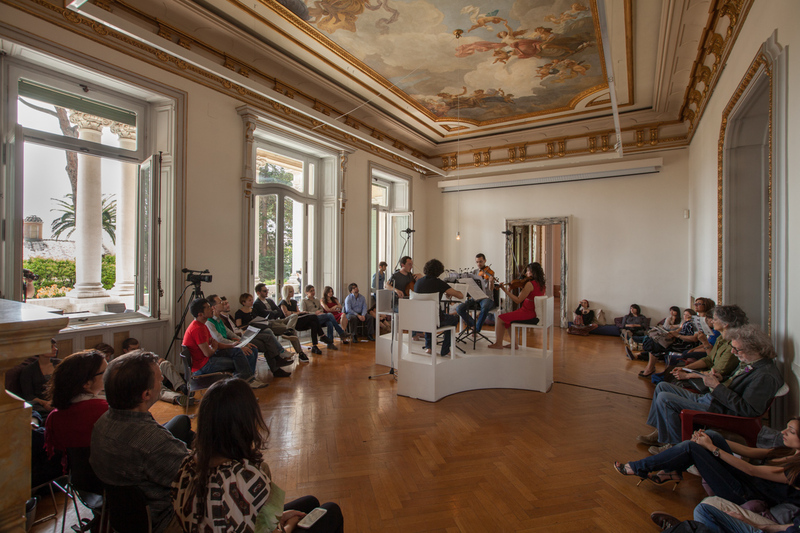 The experiment is conducted in the Reception Hall of Villa Maraini, entirely refurbished for the occasion by Christoph Schmidt and Susan Vecsey (members of ISR 2012/13). Black Mountain String Quartet: Cristiano Serino (violin I), Mervit Nesnas (violin II), Riccardo Savinelli (viola), Alfredo Mola (violoncello). Susanne Vécsey & Christoph Schmidt (CH): For once the piano nobile of the Villa Maraini should be filled with life. Diverse furnishing of all mayor rooms should create convenient spaces to spend an entire Saturday afternoon listening to the string quartet, reading books while having a tea or even taking an after-lunch nap. In the central hall the custom-made white sculpture consisting of four interconnected chairs is meant to be a pedestal for the musicians rather than a stage. From early afternoon until after sunset a softly lit naked light bulb is hanging above the musicians. It marks a constant point of concentration within these hours of contemplation. Formed for the occasion, the Black Mountain String Quartet takes its name from the famous experimental arts college in North Carolina, where the ideas of the Fluxus movement, and of composers like J. Cage, M. Feldman and La Monte Young, were developed. Black Mountain College was located in a relatively isolated rural setting, with modest financing and an informal spirit of collaboration. Certain innovations, ties and unexpected connections that took form at Black Mountain had a lasting influence on American art in the postwar era. Buckminster Fuller met Kenneth Snelson, a student at Black Mountain, and the result was the creation of the first geodesic dome (improvised with boards in the school courtyard); Merce Cunningham formed his dance company there, and John Cage staged his first happening. Black Mountain College was a school of artistic disciplines based on the pedagogical concept of progressive education. At the time, it was a unique experiment in instruction due to the artists and writers that guided it, and as such it became an important incubator of the American avant-garde. He began his musical studies at the age of four with violin and pianoforte, followed by violoncello, studying in Naples with Giacinto Caramia, in Florence with Andrea Nannoni, in Rome with Jorge Schultis, in Cremona at the Accademia Walter Stauffer with Rocco Filippini, and in Vienna with Christopher Stradner. He has worked, among others, with the Orchestra A. Scarlatti of Naples, the Orchestra del Teatro Lirico of Bergamo, the Orchestra Sinfonica of Rome, the Symphonica Toscanini and the Orchestra del Teatro Regio in Turin. He presently collaborates with the Orchestra dell’Accademia Nazionale di Santa Cecilia in Rome. In April 2005 he was the sole Italian admitted to the finals for selection by the Orchester Akademie des Bayerischen Rundfunks. He frequently works with chamber ensembles of all kinds, with musicians like Luigi Piovano, Lorenza Borrani, Giacomo Fuga and Sara Mingardo. He is also an assiduous member of contemporary music ensembles, gaining gratifying acclaim from leading figures on the contemporary music scene like Fabio Vacchi and Luciano Berio. A graduate of Conservatorio Guido Cantelli of Novara. Advanced training at the Accademia Stauffer in Cremona, under the guidance of Bruno Giuranna. He later moved to Belgium and took a degree at the University of Ghent under the Russian virtuoso Michael Kugel. At the same time, he took a degree in Philosophy at the Amedeo Avogadro University of Western Piedmont with Prof. Livio Bottani, writing a thesis on Philosophy of Music regarding Vladimir Jankélévitch. He works with several orchestras and has continued to develop his chamber and symphonic repertoire with musicians like S. Braconi, D. Waskiewicz and G. Karni. He works with the magazine “Allegro con brio”, writing articles on music and philosophy. Since 2004 he has been First Viola of the Orchestra Sinfonica di Roma, where he has had a chance to study the symphonic repertoire in depth, also performing as a soloist in Strauss’s Don Quixote and the Sixth Brandenburg Concerto of Bach. A great lover of literature and books, he has recently published short stories with Giulio Perrone Editore. Italian, of Austro-Persian origin, born in 1983 in Transylvania. She began to study violin at the age of five. She started at the Conservatory of Budapest, then moving on to the Conservatory in her city Cluj-Napoca under the guidance of Mariana Persa. In 1996 she moved to Rome and continued her training at the Santa Cecilia Conservatory with Camillo Grasso. In Rome she has performed regularly in concert halls and prestigious institutions like the Parco della Musica, Filarmonica Romana, Auditorium della Conciliazione, Accademia di Ungheria, Palazzo del Quirinale, Campidoglio, St. Peter’s Basilica, Oratorio del Gonfalone, Villa Celimontana, Accademia di Romania, and all over Italy as well. With the I Cameristi di Santa Cecilia she has performed in tours in Belgium, Egypt, Finland, China, Russia and the United States. She focuses on chamber music, working in ensembles with Enrico Dindo, Uto Ughi and others, and in different groups, including duos, trios and quartets, including recent performances of the Jubilee of Queen Elisabeth of England and at the Swiss Embassy in Rome. Born in Rome in 1973. He attended the S. Cecilia Conservatory in Rome, graduating in Violin under the guidance of Aldo Redditi, and in Composition with Teresa Procaccini and Luciano Pelosi, and in Orchestra Conduction at Latina Conservatory. He attended serveral composition Master Classes with composers such as Louis Andriessen, Ivan Fedele, David Lang, Azio Corghi, Adriano Guarnieri. In 1999 he meets Hans Werner Henze, and with him he regularly studied at La Leprara in Marino (Rm). His music had many executions in eminent locations in Italy (Biennale di Venezia, Teatro dell’Opera di Roma, Fondazione Arena di Verona, Auditorium Parco della Musica, Palazzo delle Esposizioni di Roma e l’Oratorio del Gonfalone di Roma, Associazione Alessandro Scarlatti di Napoli, Dolomiti Musica Festival, Incontri Europei di Bergamo) and abroad (Manchester, Preston, Nottingham, Ginevra, Washington, Lelocle, Ankara, Beirut, Teheran, Madrid, Pechino, Lubljana, Maribor, Meiningen). His compositions have been broadcasted from Rai Radio 3 and other national and foreign radios. He taught armony, analyis, composition, orchestration, improvisation in the Conservatory of Ferrara, Cosenza, Latina, Castelfranco Veneto, Salerno and Benevento, where he is now teaching armony and musical analyis.